The medical profession classifi es abortion as induced or spontaneous. The lay public, however, tends to equate the term abortion with one that is induced, whether therapeutically, self, or criminal, and to associate the term miscarriage with spontaneous abortion (Beard et al. 1985). Spontaneous abortion is usually defi ned as the involuntary loss of a conceptus before the fetus has attained viability (World Health Organization 1970). Although this appears to be a simple defi nition, there are numerous diffi culties with it. First, the gestational age at which the fetus attains viability is subject to much debate, especially with the advent of improved medical care of infants who are born prematurely or are of very low birth weight. Second, the legal criteria on viability of the fetus varies among jurisdictions, and definitions of spontaneous abortion have been given as a pregnancy loss at gestational ages varying up to between 20 and 28 weeks (World Health Organization 1970). 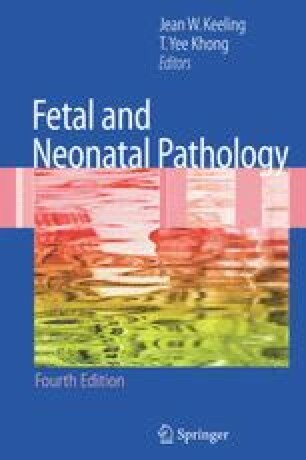 These differences make it diffi cult to compare data, and a new defi nition—“complete loss of conceptuses weighing less than 500g or, when birth weight is unavailable, the corresponding gestation age (22 weeks) or body-length (25 cm crown–heel), irrespective of whether or not there is any sign of life”—is recommended (World Health Organization 1975).